When I run, sometimes it feels like I’m riding a horse and I can go all day – and sometimes I’m literally dragging my body round the roads. Now we all know that run performance is affected by sleep, recent food & alcohol intake, stress and so on, but how about temperature? It always feels harder to run in warm weather – and I ran my half marathon PB in easily the coldest conditions I’ve raced in. The nice thing about temperature, as opposed to the other factors listed above, is that it’s easy to measure – and while I don’t have records of the outside temperature at the start of each run, the meteorological services round the world do usually publish records of local daily temperatures. Met Éireann do publish the daily maxima and minima recorded at weather stations around Ireland. So, with an idle couple of hours, I explored the question of whether the temperature affects my running speed. I record my runs on a Garmin watch (an F10, recently replaced by a F235). I can easily upload the records to Garmin’s website, and then download all my records going back to Januiary 2015. This I did. 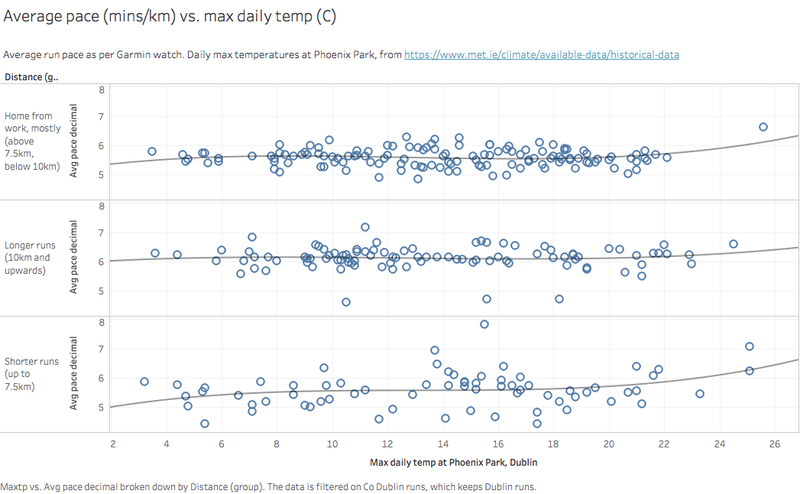 Records of Irish temperatures are available here https://www.met.ie/climate/available-data/historical-data so I downloaded the historical daily data of the weather station nearest to me, Dublin’s Phoenix park. Each file needed tidying up. The weather data had records going back many years before 2015, which I deleted – and my run data had some spurious records, mostly from accidental presses of watch buttons while not running, which had to be weeded out by sorting the data by time, then distance, then pace & deleting the bad records. Also, I converted pace values to decimal minutes to get around a problem I had with Tableau treating mm:ss values as dates & times. Then I uploaded both files to Tableau Desktop (a great, if expensive tool, for visualising data). I joined the 2 tables on the date field (inner join). I created a filter to remove all my runs outside the Dublin area. I like to run on my travels, but if I left these in and used local weather records, I’d be introducing all kinds of other factors (big hills, big dinners the night before, conditions underfoot e.g. beach), as well as adding a whole pile of work for the sake of a relatively small number of data points. Many of my runs are home from work of an evening, and these tend to be slower because of junctions and traffic, and because about half of it is uphill – so I separated these out from my shorter & my longer runs, giving three groups of runs by distance. Finally, I plotted daily max temperatures for the Phoenix Park against my race pace in each group, and added polynomial trend lines. Race pace is measured in minutes per kilometre, so the lower the number, the faster I’m moving. Firstly, let’s compare the three graphs and see what leaps out. The top one has more data points, and they are clustered tightly together. I guess that reflects the fact that they’re nearly all on the same route at the same time of day. The longer runs are pretty consistent, with a few outliers to reflect the fact that there are some 10k races and half marathons in there (faster) and a few >25km marathon training runs (slower). The shorter runs are all over the place, pace-wise. That’s because these contain some races, some speed sessions, and some runs where I’m recovering from injury/illness so taking it real slow. I don’t much like shorter runs, so I mostly only do them with a specific purpose in mind. So what’s the effect of the temperature on the pace? From the trend line for each distance group, you can see that when the temperature rises above 20C, my pace slows significantly. However, as you can see I don’t have many of those records – probably because we don’t get many of those days in Dublin. Maybe, too, I avoid running when it’s warm. It’s also noticeable that when it’s cold (below 6C), I do tend to be quicker, though not so much on my longer runs. It’s not a very pronounced effect though – I suspect because when it’s cold, I tend to wear leggings & a thermal vest, which keeps me warm (and thus slower). However, the p-values for each trend line are 0.158, 0.900 & 0.135 respectively, so there’s nothing here to get excited about, statistically. So there you have it. I think you can say I’m slower when the temperature’s above 20C, but there doesn’t seem to be much of an effect, overall – so I’ve no real excuse for a slow pace on a warm day! 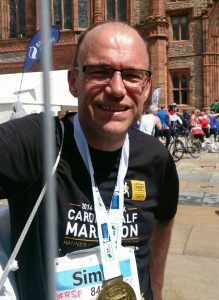 By the way, if you’re interested in more stats about running, check our Barry Smyth’s Running with Data articles. This entry was posted in Data analytics, Running on July 21, 2018 by Simon Rees.